Olga Preobrazhenska was born in St. Petersburg on January 21, 1871. Her mother died shortly after her birth and her father took very little interest in her after that. Even though she came from a family that had no connections whatsoever with the ballet or any of the other arts, Olga Preobrazhenska decided early in life that she was going to be a dancer when she grew up. She started lessons with Leopoldina Lozenskaya, who was a former dancer at the Mariinsky Theater. After numerous rejections, by the age of ten, she was finally accepted into the St. Petersburg Theater School. She did her intermediate under Lev Ivanov, Christian Johansson and her advanced with the famed choreographer Marius Petipa. Olga Preobrazenska had limited possibilities as a ballet dancer, as she was short, plain, had mild scoliosis and a hyperextended knee. She didn’t give up easily though and over the years with continuous self-discipline and hard work, she overcame her shortcomings and achieved great success as a pupil. Upon graduation in 1889 she immediately entered the Maryinsky Company for which the theater school existed. 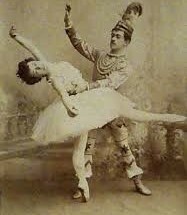 At first, Olga Preobrazhenska was relegated to the back row of the corps de ballet with no hope of becoming a soloist. Nevertheless, she achieved this distinction by 1896 and was elevated to the rank of a ballerina by 1900. She also danced in Fokine’s Chopiniana (1908; 1909), and as late as 1915 he staged Tchaikovsky’s Romance for her when she was 44. Olga remained a leading dancer there for nearly thirty years. Despite her poor figure and lack of allure, Preobrazhenska was a hard worker and through sheer determination, her career advanced steadily. She was gifted with a lively personality, personal charm, and a dazzling smile which she conveyed easily across the footlights, and she became very popular with the St. Petersburg audiences. She was never satisfied with her art and even though she was a mature and respected dancer, Olga Preobrazhenska took lessons from Enrico Cecchetti and Nicolai Legat, as well as Caterina Beretta in Milan, Joseph Hansen in Paris and Katti Lanner in London. She also studied music (piano) and took voice lessons. In 1895, Preobrazhensak made her first trip abroad touring for the Mariinsky in the company of Matilda Kshesinskaia and her brother Joseph Kshesinsky. She appeared in Dresden in Monte Carlo and at La Scala in Malan (1904) and in Paris in 1909. In 1910 she danced a shortened version of Swan Lake in London for the first time and in 1912 toured in South America. During the First World War, she trained as a nurse and went on to work in several hospitals in order to learn as much as possible about her new craft. She served in various military hospitals and conducted a small hospital in the courtyard of her home, all the while continuing to teach her classes in ballet under increasingly difficult conditions. She taught at the St Petersburg Theater School from time to time and after the Russian Revolutions of March and November 1917, she continued with her career by joining the new School of Russian Ballet which was newly founded by Akim Volynsky. Here the newest and most innovative ballet techniques were being taught and further developed. She served as a teacher until 1921. She worked training the greats like Agrippina Vaganova, Alexandra Danilova, Olga Mungalova, Vera Volkova and even Vaganova who went on to become the greatest dance teacher in the Soviet Union and the founder of Soviet Ballet. Olga Preobrazhenska found the destruction of the old world of Imperial Russia of which the ballet had been so much a part of very difficult to cope with and in February 1921 she left Russia for Finland. After a few gala performances in Riga, Latvia (which was no longer a part of Russia), she went to Berlin where she danced wherever she could get an engagement. She wrote to La Scala in Milan where she had performed four times in the past and received an invitation to choreograph there for an entire opera season. After this, she realized that Berlin had nothing to offer her and she left for France shortly after her return from Milan. In 1923 she settled in Paris and opened a private school at the Studio Wacker. As her fame spread, she became one of the most distinguished and sought after teachers in Europe until her retirement in 1960 at the age of 89. As a dancer, Olga Preobrazhenska was admired for her precision and the perfection of her technique, as well as her soaring leaps. She had wonderful musicality and was a natural actress. She had a gift for improvisation. She was never considered much of a success as Odette-Odile in Swan Lake or as Gizelle. However, it was as a teacher that she left her mark on the world of classical dance and she devoted herself to passing on the traditions of the Russian Ballet. She had an ability to detect and weed out the defects in her pupil’s work that made her a born mistress of ballet instructions. She was a firm believer in Cecchetti’s code that ballet dancing must be mastered in the classroom first and could not be mastered later on the stage. With her authority and rigid discipline, she gave her pupils an extraordinary command of technique. When the Ballet Russe de Monte Carlo was formed in 1930, most of the dancers were former pupils of Peobrazhenska’s including its earliest two stars Tamara Toumanova and Irina Baronova. Other dancers who studied under her or who came to take classes with her in both St Petersburg and Paris included Margot Fonteyn, Hugh Laing, Vladimir Skouratoff, Mialord Miskovitch, Ludmilla Tcherina, Nina Verchinina, Igor Youskevitch as well as company directors and other well-known teachers. She was an intensely private person and never married. She tended to keep people at a distance. Her closest friend was her former pupil and later assistant Elvira Rone, who especially in her later years managed her studio for her. She never quite accepted that her career as a dancer was over and suffered from recurrent depression over the years. She could be abrupt to the point of rudeness, yet she was kind and generous and often taught impoverished children for free. She was a great lover of animals and birds. In her last years, she was ill and living in poverty and she depended very much upon the charity of Toumanova. She died in a nursing home in Sainte-Mande, France on the 27th of December 1962, just a few weeks away from her 92nd birthday. She was mourned as one of the last survivors of the Golden Age of the Russian Imperial Ballet. Going Back To Work For Dance Teachers Is Really Difficult! Thanks for stopping by Tracy. It was hard finding a lot of information on Olga, as there were a lot of famous ballerina’s at the time. I did not know about Olga Preobrazhensak before reading your article. It was really nice to know about her. Her Story is full of inspirations. She is one of the best examples of a dying heart dance lover. I personally like ballet dance. Whenever I get a chance to watch a ballet performance I don’t miss it because it blows my mind. There’s another thing which made my heart love Preobrazhensak which is she is an animal lover and I am love animals too. I found her story interesting as you have written it in really a nice way. Is there anything else you would like to share with us about her. I would love to read. Thanks for stopping by Shahed. I discovered this hidden gem quite by accident, and there was not terribly much written about her, but I will keep looking as she is an inspiration to all.